It's not often that I get astonished by an unexpected coffee find, but I guess Santa knew exactly what I wanted when I visited his house on a trip to the North Pole (Alaska). The day had a few things on the list and what trip to the center of Alaska would be complete without a stop at the North Pole. 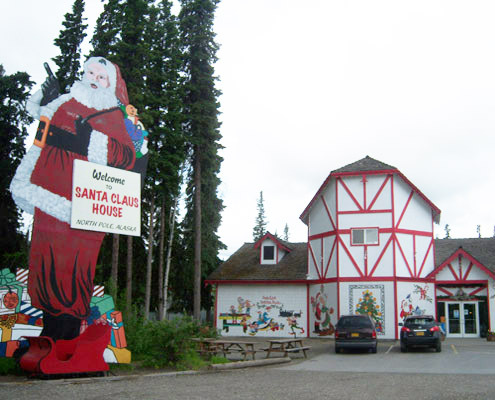 Not only are the streets and town a Christmas-themed wonderland but it's also home to a shop called Santa Claus House. The place not only has lots of cool gifts, including letters "from Santa", but also reindeer and a plenty of Christmas-y scenery for pics. Scurrying through the doors, the first thing that caught my eye was that Santa had his own cafe, a cute corner outlined with colorful striped wallpaper. Not thinking Santa to have a decent coffee operation (I believed him more into cocoa), I initially passed it by but after a sweep past and noticing the non-oily beans in the espresso hopper, I questioned the jolly barista as to their coffee wares. It turned out that they serve North Pole Coffee Roasting Company, using their espresso blend (I believe Espresso Classic) for their shots and the North Pole Blend in their pump pots. Curious, I ordered a doubleshot and a cup of the drip, and on both accounts I was pleasantly surprised. The espresso, though pulled a little long (about 3-4 oz) and with thick, blonde crema, it held a milky texture with the flavors of bitter cocoa, cinnamon and gingerbread, which were not only fitting but a delicious combination. The drip smacked of almond milk, chocolate, beef broth, oregano, light tea and a light/medium body. I did not note the tea. With a ho ho ho, I polished off my drinks and deemed my stop at Santa's abode a nice surprise. Were the baristas a little more fanatical in their espresso skillty / coffee prep (as the coffee itself seemed fresh, tasty and well-roasted), the coffee here could be top notch. If you ever manage a trip to North Pole, AK make sure to pay Santa a visit at the Santa Claus House.